fishing lures by Krippled - "recreation section"
'KRIPPLED' BAITRIGS Combines the simplicity of an artificial lure with the effectiveness of live bait. SLASHER FLASHER A unique line-thru design flasher. JIM GILBERT DODGERS A full size range of polished stainless steel dodgers. 'KRIPPLED' HERRING DODGERS A full size range of polished stainless steel dodgers. 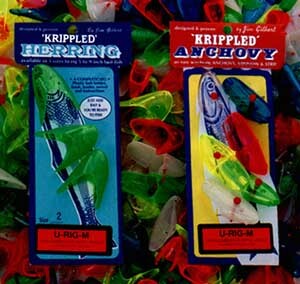 'KRIPPLED' fishing lures, are a unique line of lures developed in the salmon rich waters of British Columbia, Canada. 'KRIPPLED' lures were designed specifically for salmon and trout, and have been used with great success by thousands of local fisherman for over thirty five years!